The majority of pseudocysts are asymptomatic. However, they may present with a variety of clinical symptoms depending on the location and extent of fluid accumulation. Upper abdominal pain or distress of insidious onset, often localized to the midepigastrium is the most frequent symptom (4). Expansion of the pseudocyst may likewise result in duodenal or biliary obstruction, vascular occlusion, or fistula formation into adjacent structures such as the viscera, pleura, or pericardium (6). Leakage from the pseudocyst or pancreatic duct with concomitant fistula formation can result in pancreatic ascites or a pleural effusion. Pseudocyst rupture occurs in less than 3% of patients (7), and may be clinically asymptomatic. However, rupture into the peritoneum can present as an acute abdominal event necessitating emergent surgery, which is often fatal (8). Erosion into the gastrointestinal tract may result in hematemesis, melena, or massive hematochezia (9). 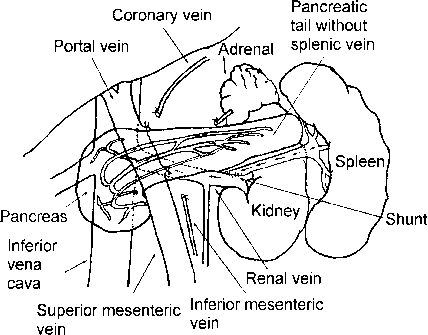 Massive bleeding into the gastrointestinal tract occurs in approx 5-10% of patients (10,11), and occurs as a result of pseudocyst erosion into a major pancreatic or peripancreatic vessel, leading to free rupture or pseudoaneurysm formation (12). The diagnosis should be suspected in patients with an unexplained drop in hematocrit, recurrent gastrointestinal bleeding or in the setting of an enlarging pulsatile mass or abdominal bruit in patients with increasing abdominal pain. Bolus dynamic CT is the most useful initial diagnostic modality to demonstrate the presence of hemorrhage or a pseudo-aneurysm. Subsequent angiography is the procedure of choice for isolating the site of bleeding and directing embolization therapy (11). Surgery is otherwise indicated in patients who are hemodynamically unstable or when embolization is unsuccessful or technically not feasible. Secondary cyst infection occurs in approx 10% of patients (7). A confirmatory diagnosis is established on the basis of a positive Gram stain or bacterial isolate from the cyst aspirate in the context of frank pus or sepsis. Percutaneous drainage is successful in approx 85% of cases and should be the initial treatment of choice (13).